The Penguin Guide to Jazz is a reference work containing an encyclopedic directory of jazz recordings on CD which are currently available in Europe or the United States. 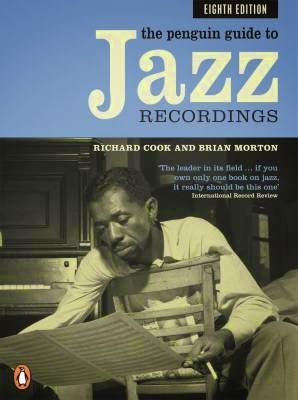 The first nine editions were compiled by Richard Cook and Brian Morton, two well known chroniclers of jazz resident in the United Kingdom. The Penguin Guide to Jazz Recordings is now firmly established as the world's leading guide to recorded jazz and the 10th edition appeared in 2010. Reviewing over 11,000 CDs, some 200 of them have been selected as the "Core Collection", "a basic library of jazz records which readers on a budget or those who wish for only a small holding of jazz CDs might consider as their first-priority purchases". So basically, these albums are considered the most essential jazz recordings. I could not find the 2010 list but click here for the complete core collection list of the 2008 edition. Wes Montgomery: "The incredible Jazz Guitar of"
Grant Green: "The Complete Quartets with Sonny Clarke"
Pat Metheny and Charlie Haden: "Beyond the Missouri Sky"
Depending on the edition, the core selection varies a bit over the years but Wes and Joe always seem to make it to it. Surprisingly, Django was not on the 2008 list. My two favourites of this list are "Incredible Jazz Guitar" and "Virtuoso." But there is no doubt in my mind that Wes' "Incredible Jazz Guitar" is the most essential one of the essential jazz guitar ones in the core collection. So here it is for you to listen to. The most important jazz guitar album of all time? There's certainly a number of arguments to be made for this album. But it remains a debatable issue. Let's play some Joe Cohn. 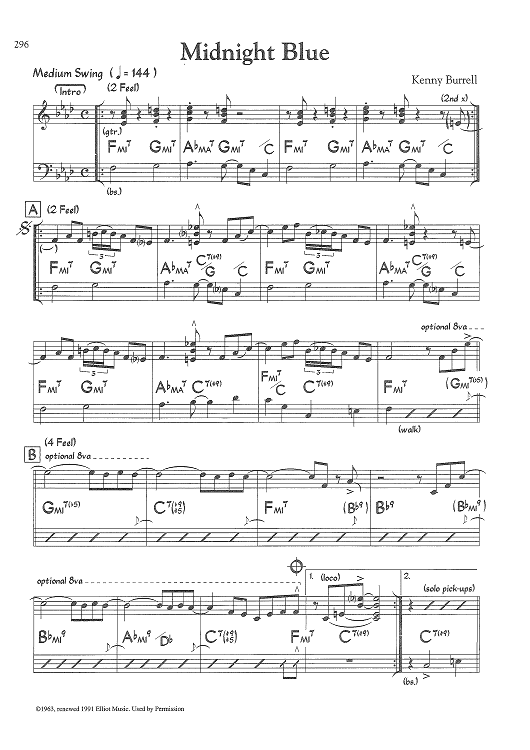 Here's a transcription with Tabs that was done by Paul Mitchell Brown. The track is from the 2004 valbum "Cool" by the Jay Leonhart Trio. The album was recorded in the drummerless trio format that I dig so much. Joe Cohn is fantastic throughout. 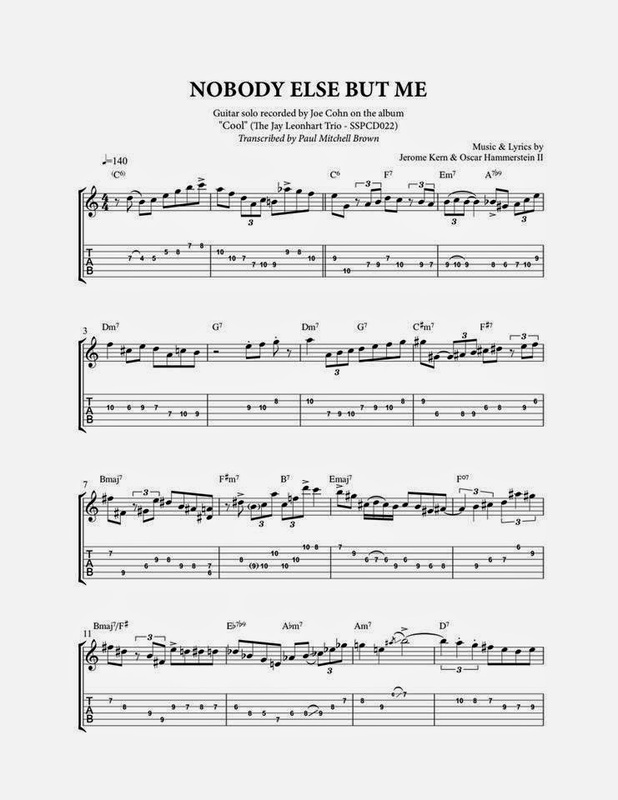 Here's Joe's solo on "Nobody Else but Me". Thanks Paul! In an earlier post I mentioned this album as a personal favourite. Time to pay some more attention to this great jazz guitar recording and share a playlist of it. 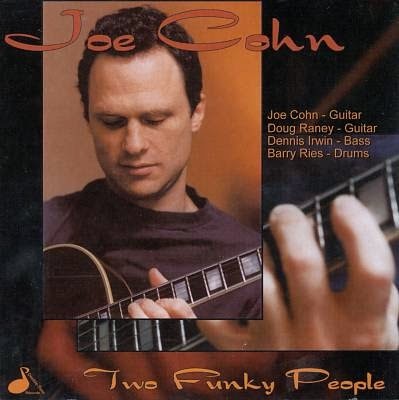 In 1997 "Two Funky People" was actually Joe Cohn's (son of tenor saxophonist Al Cohn) debut album. He chose to record it with fellow jazz guitar great Doug Raney. Like on the previous two guitar date I wrote about (Windflower with Herb Ellis and Rermo Palmier), Doug gets as much space as Joe. The result is a very enjoyable beboppish jazz guitar recording. Guitarist Joe Cohn is the prodigiously talented son of famed tenor saxophonist Al Cohn. Some may find it odd that on his debut recording fellow guitarist Doug Raney appears alongside him on many of the tracks. 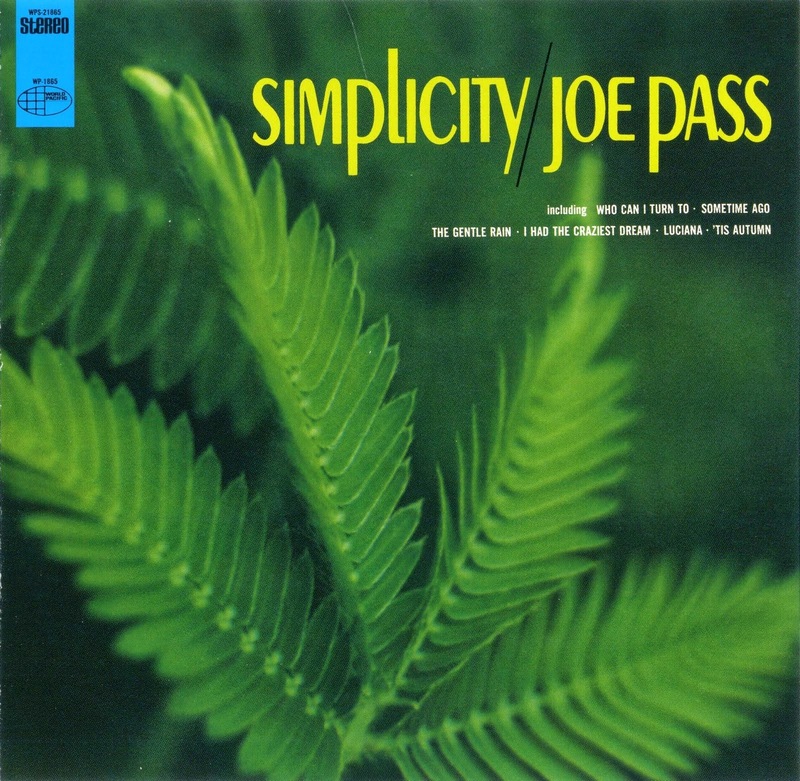 The two-guitar format is somewhat reminiscent of Joe Pass's recordings with rhythm guitarist John Pisano, although here Raney is quite prominent throughout as a solo voice. Telling the two guitarists apart will in fact require a good deal of concentration on the part of most listeners. In general, Cohn is the faster and more rhythmically adventurous of the two; his tone is brighter and more dry than Raney's. One would have hoped for more of a Joe Cohn showcase rather than a date on which another guitarist, a second "funky person," practically shares top billing. That said, both Cohn and Raney are fantastic straight-ahead players and they make beautiful music together, aided byDennis Irwin on bass and Barry Ries on drums. Four of the tracks are seldom-played gems by Al Cohn, including the title track. Another, "Motion," is by Doug Raney's famous father, Jimmy Raney. (Perhaps it is the famous dads connection that brought these two together.) Other tracks include the classics "But Not for Me," "Solar," "Days of Wine and Roses," "Ask Me Now," and "Serenata." Thad Jones's mid-tempo burner "Quite Sip" is Cohn's one trio feature, and a great one. In the old days I used to play along with Band In a Box a lot. Later on I switched to the iRealbook on my iPad. These days, whenever I need a backing track, I just type in what I need in Youtube and I am very likely to find it there. Here's a few useful channels for backing tracks that sound ok. The tracks were made with Band In a Box 2014. There's a lot more backings on the Tube but somehow I keep on returning to these two. I hate midi sounds but BiaB has used samples of real instruments for a few years (Real Tracks). The guys that created these two channels use these. 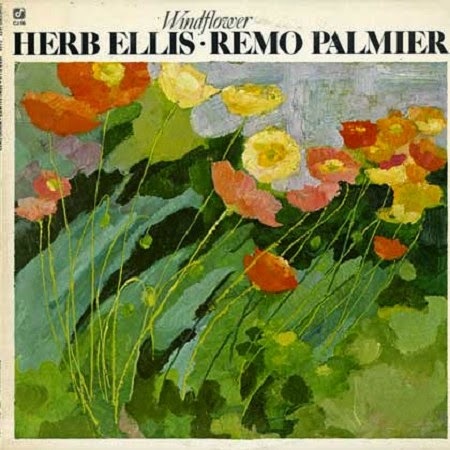 Windflower is an album that Herb Ellis recorded in 1977 together with Remo Pamier. Actually Herb was the leader on this date but Remo gets as much space as he does. This is my favourite Herb Ellis album and kind of special to me. I remember getting it from the music library in the early 1980s, taping it on cassette, and playing it over and over again in my car stereo on my way to college. I was not playing jazz at the time (and would not be doing so for over a decade) and was still in rock bands, but I loved the sound of jazz guitar already and this album was one of a few that kindled my interest in the genre. Listening back to it today, I still think "Windflower" is a fantastic album. Herb is really playing at his strongest on this album and the interplay with Remo - a very fine player - is superb. I somehow never found it available for listening on the internet - it's not on Spotify or Youtube except for a single track that I added below- but today I discovered the whole album it on Grooveshark. And the good news is you can listen to it without the annoying ads that you find on Spotify. Click here to listen to the entire album on Grooveshark. 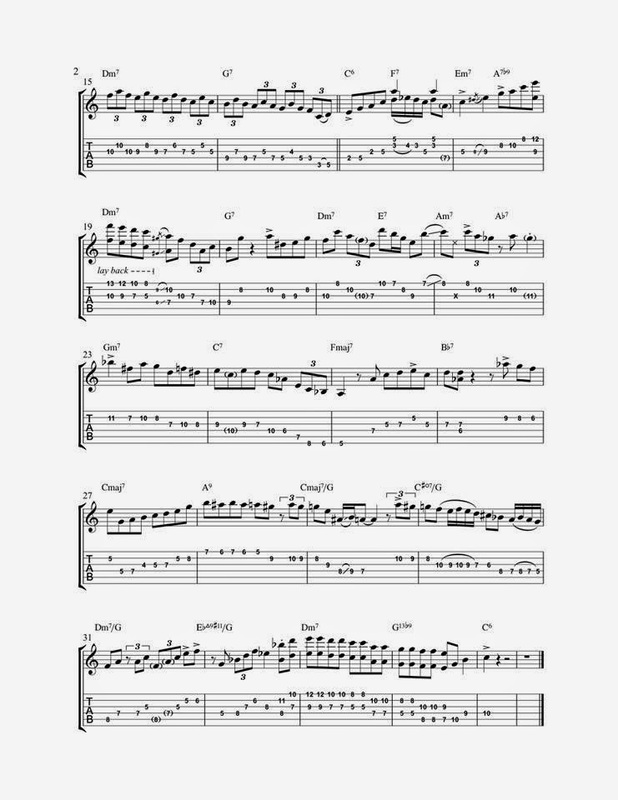 Click "play all" and enjoy some gorgeous jazz guitar sounds. To me, it's a bit like going home. "This album is most significant for being the first jazz recording in a few decades by guitarist Remo Palmier (who was also known early on as Palmieri). Fellow guitarist Herb Ellis was the leader but he gives his guest just as much solo space as he takes and, with the tasteful accompaniment of bassist George Duvivier and drummer Ron Traxler, the two old friends challenge each other on a variety of appealing chord changes including "The Night Has a Thousand Eyes," "Close Your Eyes," "Walkin'" and Jobim's "Triste." The success of this boppish set led to Palmieri getting his own Concord album the following year." I have always had a soft spot for drummerless trio recordings. I have written about Tal Farlow and Billie Bean in this format earlier. I happened to come across this Pacific Jazz album on Youtube and liked it immediately. 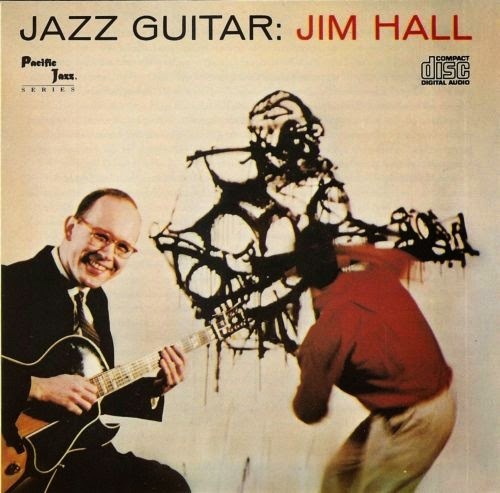 It features Jim Hall's' debut as a leader in 1957. Jim is accompanied by Red Mtichell on bass and Carl Perkins on piano. It is very much a bebop date. A lovely album with that great 1950s vintage sound. I could not help smiling when I read one of the comments under the video: "How could such a talented jazz mofo look so much like my kid's dentist?" I came across this remarkable clip on Youtube. It was posted by bass player Ruud Jacobs, who was part of this classic session that was recorded for Dutch National Radio in the 1960s. Besides Ruud on bass, it features Hank Mobley on tenor, Pim Jacobs (Ruud's brother) on piano, Han Bennink on drums and Wim Overgaauw on guitar. 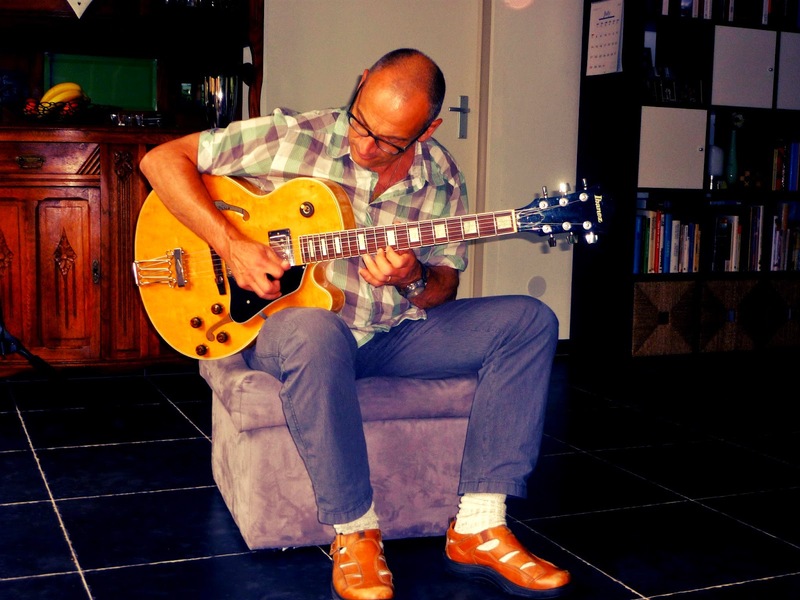 Vintage Dutch jazz! By the way, I take it most of you guys already know of the classic Pim Jacobs Trio recordings with Wes Montgomery in 1965. Same group basically but without Wim on guitar of course. Pretty amazing stuff. For a new project I needed an electro acoustic steel string guitar. My budget was limited, 700 bucks at most. I shopped around on the internet and went to a local store to try some budget electro acoustics but was very underwhelmed by the offering. I considered getting a Yamaha Silent Guitar but there was no local store around that actually carried them so I called up a Yamaha dealer in Weert and he told me that I should come over to check out this new brand that offered great value for money: LAG guitars. I had never heard of the brand. I found some demos on Youtube that sounded promising and visited their website for more info. 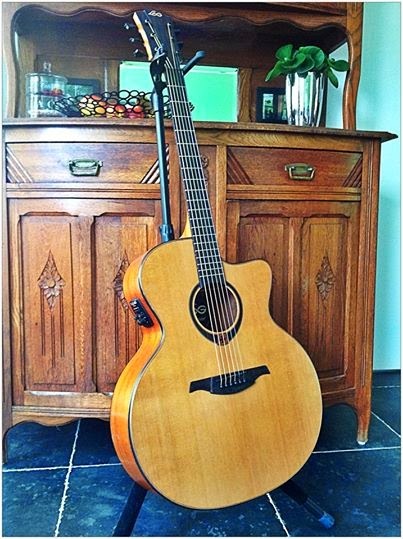 I liked what I found so I went to Kollee Music in Weert and played an electro acoustic with cutaway (LAG T 100 ACE) that really sounded and felt great. Way better than guitars I had played that were twice the price of the LAG. Wow. It was only 399 euros. I left, seriously considering a purchase. When I revisited the LAG website again, I found out there was a Jumbo electro acoustic with a cutaway too. It looked even better than the T100 I had played at the store. So a week later I returned to Kollee Music and, by coincidence, they had received the Jumbo T200 JCE model that I had seen on the website. I picked it up and knew at once this was the one. Big, fat, deep acoustic sounds and well constructed with unexpected attention to detail. The guitar looked much more expensive than it really was (469 euro) and was vey light and responsive acoustically with a good sound balance and no dead spots on the neck. Solid cedar top, mahogany neck, back and sides. I guess the back and sides are laminate. I bought it without much further thought. I am no expert in the field of acoustics but I know a good guitar when I play one ... And, in addition, it was easily the best looking acoustic I had seen so far. It actually looks like a jazz guitar!